The first South African to be jailed for racist slurs went to court on Wednesday in a bid to appeal her conviction and three-year jail sentence. 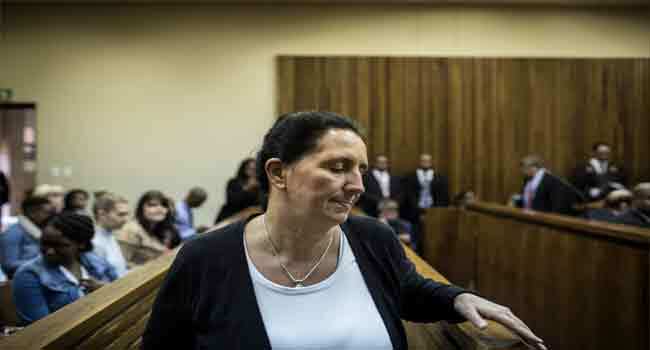 Former realtor Vicki Momberg, 49, was last month sentenced to three years with one year suspended after being found guilty of four counts of crimen injuria — wilfully hurting someone’s dignity — for repeatedly hurling the word “kaffir” at a black policeman. Her case turned the spotlight on racial divisions in South Africa a generation after the end of apartheid rule. Momberg had been caught on video verbally abusing a black police officer who had been trying to assist her following a break-in of her car in 2016. She used the word “kaffir” — a deeply offensive term in the racially-sensitive country — 48 times. She is the first person in South Africa to be sent to prison for crimen injuria. Previous convictions typically resulted in fines. In 2016, another white real estate agent Penny Sparrow was fined $10,000 for comparing black beachgoers to monkeys in a Facebook post. The state prosecution Yusuf Baba on Wednesday opposed Momberg’s application describing it as “vague” and “fatally defective”. “The grounds of appeal are bad,” said Baba. The appeal hearing continues next Wednesday. Momberg’s sentence was largely welcomed by the government, civil society groups and many South Africans. But campaign group AfriForum, which advocates for its largely white membership, many of whom speak Afrikaans, criticised the sentence saying it exposed the application of double standards in matters concerning race.